Worn out after a great practice! Chushin Aikikai is a community-based organization in Omaha, Nebraska, founded to teach and practice the principles of Aikido. Aikido is a Japanese martial art based on a philosophy of nonviolence and nonagression. The dojo is currently run by volunteer efforts, and is a member of the United States Aikido Federation (USAF) and the Hombu Dojo in Tokyo, Japan. The USAF is currently headed by Yoshimitsu Yamada, an 8th Dan Shihan (master instructor) and a direct student of O Sensei for more than 10 years. Yamada Sensei is also the chief instructor of New York Aikikai. Our instructor, Dan Hayes, began his studies in 1987 under Peter Bernath, 7th Dan Shihan, at Florida Aikikai. Dan Sensei is currently a Yondan (4th degree black belt) and Shidoin (certified examiner) of the USAF. He also serves as the technical director for Tatsumaki Aikikai/KSU Aikido, a non-profit organization located in Manhattan, KS. 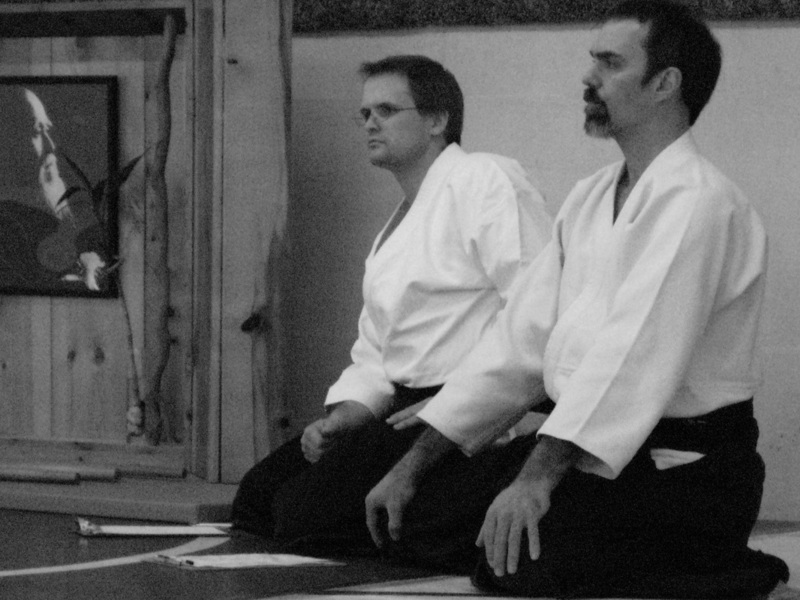 Dan-Sensei (left) with Les-Sensei, head instructor of our sister dojo in Manhattan, KS. Chushin (中心), pronounced choo-sheen, refers to “center” in Japanese. The concept of center is fundamental in aikido in regards to one’s movement, balance, and state of mind.